Very challenging - fairways are fair but the rough is rough! Lots of elevation and tricky basket locations. Creek in play often. Beautiful scenery and lots of wildlife. I-35; east on US 290. Take FM 973. Go through Manor across RR tracks to a left on Blake-Manor Rd., 3.5 miles to the park entrance on the right. Entrance road dead ends in parking lot. 1st tee along fence line. Copy/paste everything mc lazer said. 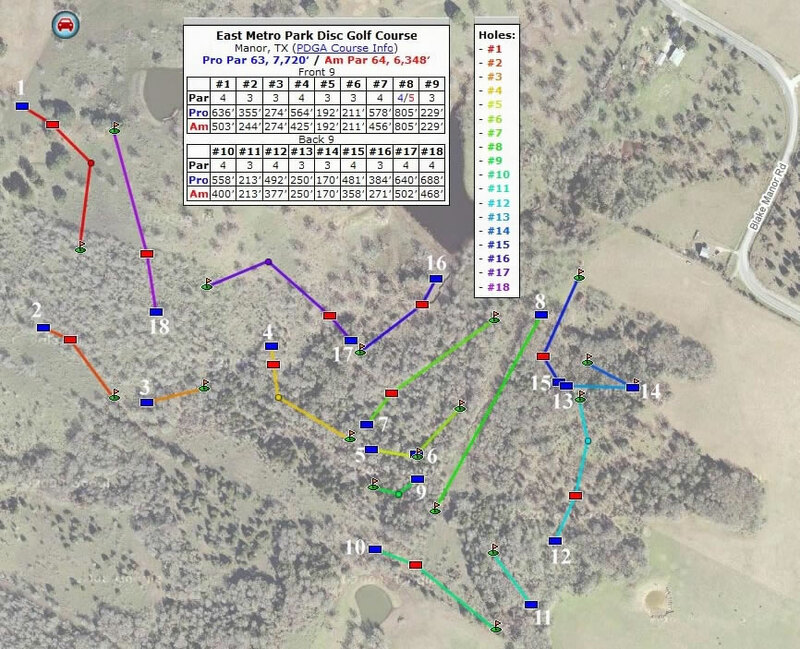 Fun but challenging course with a mix of long beast holes (#8 and #17 come to mind) and short, tight holes. Some really inventive basket placement. Hole #10 sitting on its steep banked creek peninsula is a treat.